The Trump administration’s Department of Labor is actively working to weaken or rescind the “fiduciary” rule (the rule that requires financial advisers to act in the best interest of their clients). The latest step in these efforts is a Request for Information that, among other things, requests comments from the public about whether the department should delay parts of the rule past their already-delayed current implementation date of January 1st, 2018. We estimate that the delays the department has already instituted under the new administration mean that retirement savers will lose $7.6 billion over the next 30 years. Each year of further delay will cost retirement savers an additional $7.3 billion dollars over the next 30 years. Given the large, persistent losses by retirement investors that would result from a further delay, we oppose a delay of any length of the full implementation and enforcement of the rule. 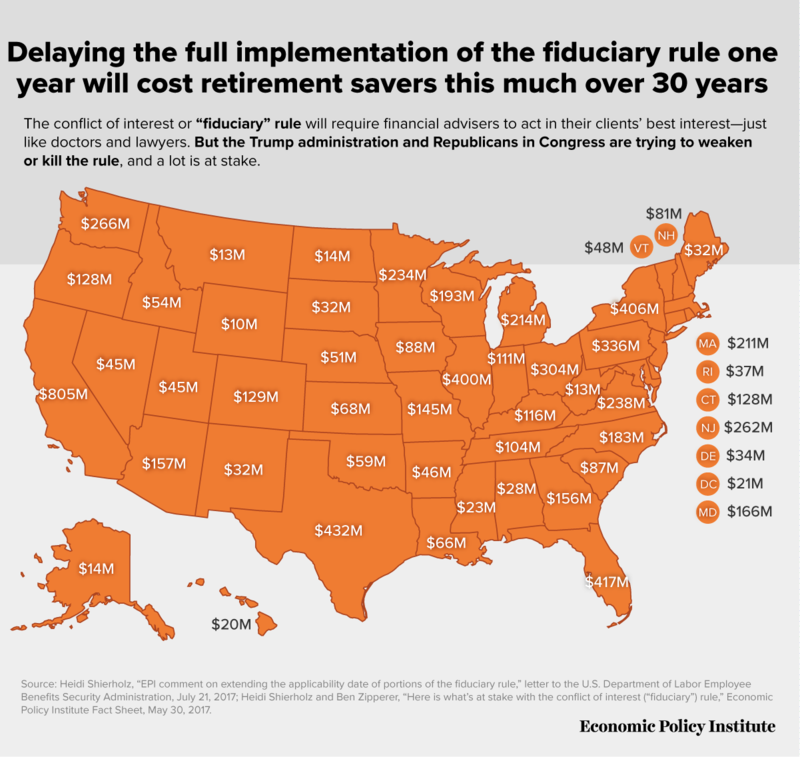 The map below shows how much retirement savers would lose in each state over the next 30 years as a result of a further one-year delay. Losses from an additional delay range from $10.4 million in Wyoming to $88.2 million in Iowa to $432.4 million in Texas and $804.9 million in California.